A former Rwandan army major is due to be sentenced after being found guilty of murdering 10 Belgian peacekeepers in the early days of the 1994 genocide. 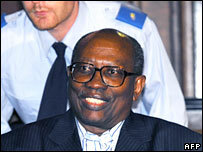 Bernard Ntuyahaga, 55, was cleared by a Belgian court of the murder of then Rwandan PM Agathe Uwilingiyimana. The Belgian United Nations peacekeepers were killed in front of Rwandan army officers, including Ntuyahaga. The murders triggered the withdrawal of UN peacekeepers. Some 800,000 moderate Hutus and Tutsis died in the genocide. Prosecutors said Ntuyahaga took the peacekeepers from the residence of the PM, whom they were trying to protect. He then handed them over to fellow soldiers in a military camp in the capital, Kigali, where they were beaten to death, shot or slain with machetes. The BBC's Mark Doyle, who was in Rwanda during the genocide, said the killing of the peacekeepers marked a crucial point because it left the UN force unable to control the situation. The 12 jurors are reconvening in the Belgian court on Thursday to decide on the sentence. Ntuyahaga can appeal against the verdict on procedural grounds but not on substance. "Sooner or later the truth will triumph, I believe that. I remain patient and I keep faith, thank you," Ntuyahaga told the court moments before the jury retired to consider its verdict. Christine Dupont, the widow of Belgian peacekeeper Christophe Dupont, said before the verdict: "It's a very important day, a day we have been waiting for the last 13 years." It is not the first time Rwandans have stood trial in Belgium over the genocide. Two Catholic nuns, a university professor and a businessman were sentenced in 2001 to between 12 and 20 years' jail for aiding the mass murders.